S14 String Hanging Lights give an inviting soft amber glow that will bring any room or party to life. They're ideal for outdoor or indoor parties, wedding receptions, romantic dinners, garden patios, decks, cafes, yards, porches, gazebos, pergolas, bedrooms, dorm rooms, store windows, and more. Bulb lights should hang in a downward direction and not be touching any object. 3 feet is required between the nearest object and the string light. Unlike other outdoor string lights, ours are commercial grade, strong, durable, ETL listed, and backed by a one-year replacement warranty in case anything ever goes wrong. Plus, the long lasting S14 bulbs are built to last for years, so you and your family can enjoy them for a long long time. Makes great Christmas gifts or outdoor decorations for patio. We know you'll love the S14 Vintage Light String. 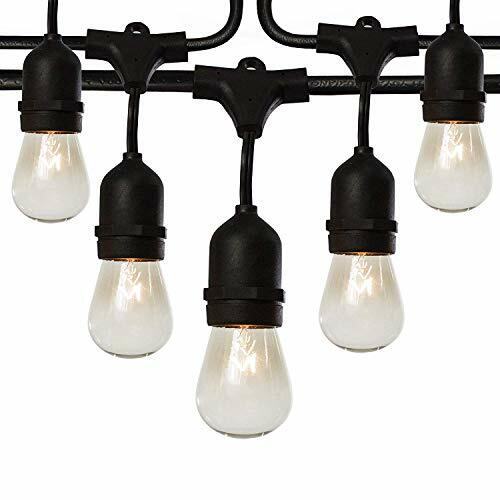 "string lights outdoor string lights backyard lights string s14 bulbs gazebo lights outdoor gazebo lights outside string lights fulton illuminations out door lighting amber lights string garden lights deck lights"
COMMERCIAL GRADE - Our S14 Lights are strong, durable, and ETL Listed. Sockets are weather-tight for outdoor use. INCLUDES FREE 13 FT EXTENSION CORD & 3 EXTRA BULBS for your convenience. No need to go searching for a matching extension cord that will blend in with your lights. One comes in the box! FREE LIFETIME WARRANTY - Fulton Illuminations stands behind all of our patio lights 100%. String lights come with an automatic 1 year warranty. Register online for a free lifetime warranty. If anything goes wrong with your purchased product (except the bulbs), we will replace it with a new item. ELEVATE YOUR OUTDOOR ENVIRONMENT - Fulton Illuminations Outdoor String Lights give an inviting warm glow that will impress your guests and bring any party to life. CONNECT MULTIPLE STRANDS TO COVER LARGE AREAS - Each 48 foot strand of patio string lights offers end-to-end connections. Attach two to cover large areas. If you have any questions about this product by Fulton Illuminations, contact us by completing and submitting the form below. If you are looking for a specif part number, please include it with your message.